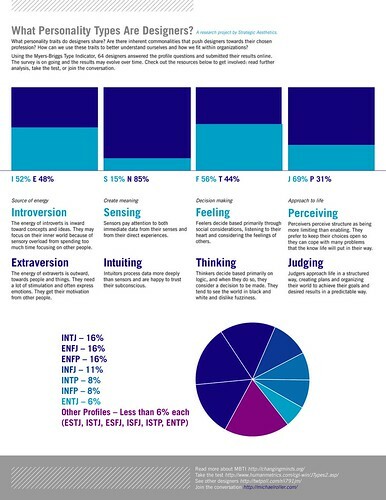 I’m an ENFP/ENFJ, having scored the same for P and J, and am what what most people would consider to be a designer. Interestingly I spent more than a decade as a health professional and was never happy – either it was a poor fit for me, or I was a poor fit for it. Without any evidence to support my thinking, other than your post, I’d suggest that being intuiting and feeling are of great value as a designer, so perhaps there isn’t one ‘type’ but certain characteristics within the type that are of importance in being a successful or good designer. There aren’t equal percentages of each personality type in the population, so you’d have to take that into account somehow. Some of the types that were most common in this survey have low percentages in general, though, so that’s interesting. You also have to consider that some personality types might be more likely to be the sort of person to take surveys :p Still a fun little experiment! Sammy – I agree that there isn’t one right answer to this question, but I’m also glad there are some general trends we see in these results to say. No problem about posting it to your blog, please share! Is the J/P bar graph backwards, or am I misreading it? i made my fiancee take this – he being my partner and the best design team mate i’ve ever had – and our results were near opposite – him being INTJ, me being ESFJ. we work really well together, but our types are different. it’s just good to be around people who can bring something different to the table. Interesting stuff, I’m an INTP (based on a written, marked test some years ago) and always maintain I have found the right career for my mindset. I think my bias towards Thinking and Perceiving help me in the more logical aspects of my role as Interface designer. I wonder how the result would vary based on different types of designers? Interaction Designer vs. Graphic Designer, for example. Designing is spread evenly across the type table. Like any other human activity. Some types may find it easier than others. It does not mean they are better at it. Each ISFJ can also access ENTP. A type is not a box. It is a way of understanding how your psyche is likely to work in the world. And the difference people bring to teams, including type difference, is as important, often more so, than the similarities people bring. craig is right – J/P bar graph is backwards.. anyway, it seems like there is a pretty even spread and that the distinction between categories is fairly negligible. hm. This study is inherently flawed. The questionnaire the volunteers filled out is not the Myers-Briggs but is a knock-off (by someone who doesn’t even know Isabel Briggs Myers’ name, yet), and we don’t know how reliable its results are. In addition, 65 self-selected respondents are not enough to draw conclusions about the population of designers. 25 years ago Michael Lyons published in “Datamation” an article called “The DP Psyche”, in which he reported his findings of the MBTI types of system developers. I don’t remember the exact number of people he worked with, but it was something like 1200 — and it was in companies he consulted for, so they didn’t volunteer themselves on the basis of their interest. *That* is enough people to draw conclusions from, and his selection method was valid. In addition, he gave them the actual Myers-Briggs (it was available only on paper at the time , so we know what the results mean. I consider your survey as an interesting start that would need more rigor to be in any way conclusive or generalizable. Not that I don’t believe that designers are more likely N than S (I do), but you’d need a larger sample size, selected randomly (asking people to volunteer themselves doesn’t work), and you’d need to give them a validated instrument. I’d be interested in seeing a poll on the quality/level of work by those designers who took the personality test. Readers could anonymously vote for their favorite three designer, and then you could match up the highest scores with their personality type(s) to determine “Which personality types make the best designer?” (the name of your original post). Ultimately, it would be rather subjective and allow for experience to come into play – but a fun exercise nonetheless. Matt – Good idea, I’m actually working on something like that. Part of the challenge with a project like this is the lack of resources – time, money, etc. (It’s also the main reason why some have criticized the reliability of the study itself.) I’d like to profile talented designers in each of the top personality groups and ask them about what makes them successful. Let me know if you know any good designers who are INTJ, INFJ, ENFP, or ENFJ. In my MA thesis (1994) I attempted to develop a creative model for industrial design organizations to optimize innovation/invention (high creative output). In order to get a baseline and correlate my data to other research I surveyed ID professionals collected at random from the IDSA (N= 180). This survey included an abbreviated MBTI and locus of control, independence, flexibility, motivation and job satisfaction measures. Personality is but one element of creative climate and I used the MBTI to correlate to other survey of “highly creative” research studies (e.g. MacKinnon and architects) . In my survey, styles I,N and P were more often correlated with “designers” were E and J with design managers. More importantly, designers need to feel that they are in control of their creative process (independence and locus of control was off the charts). I concluded that the ability to exercise (and to be recognized through) creative freedom is probably more important than personality in motivating ID’s to create within an organization. Creativity requires (at the very least) disposition, skill, motivation and organizational support in order to get a good result. Disposition ( personality) is only one aspect and probably no one “perfect” or best suited desiger MBTI type exists. 1. This isn’t the real Myers-Briggs test. The real test is usually done in a testing center then sent off to California for analysis. 2. I’d like to see the type of people who took the test, are they really designers, what kinds, how many years experience, are they students? You should group results by experience level. Although I appreciate the question and it was a fun exercise I hardly think that this can be taken seriously. I think you have a very good start and I think you should explore this subject further. Maybe you can get funding, hand pick subject individuals, and get real data. Just a thought. @Derryest – I agree with you on both points. More than I imagined, this series of posts was meant to spark some interest in designer self-awareness but not to be used too literally. I think we can generally agree that designers are typically Ns but that’s about it. Despite that limited learning, I think it’s still an interesting takeaway that made the study worth diving into. It’s difficult to conduct “research”(if I can even use that word) like this rigorously without time or money or resources, and I’m still looking for ways to make them more credible despite these constraints. Do you know any free software that can sort data like you’re talking about (experience, designer types, etc)? Can surveymonkey do that? Is there a website in which design-related research grants can be applied? Check out BB’s recent comment, I’m hoping to get a copy of that thesis to learn even more, especially considering it’s based on more thorough research. SurveyMonkey might, but I think you would need to have everyone re-take the test and answer addition questions like experience, job function, etc so you can organize and group the data. I’m not sure how you go about funding a research project. Maybe the college where you teach offers grant money or at least should know how to apply for one. I would think that universities do it all the time and you would be in a good position being part of the staff. At the very least a research project would yield some interesting results for you and the college, maybe so much so that you could write a book on the psyche the typical Designer? I also would be interested in reading BB’s report, can you share that with me when you get it please? Thanks. I think the key is switched for the last column. The “Perceiving” text is light blue, but the percentage is 31%, shown in dark blue, which doesn’t match the dark blue portion of the graph. So, “P 31%” needs to be in light blue, appear first and “J 69%” needs to be dark blue and second. Just an FYI. Really love the chart. Great insight. Aside from the critiques of the experimental design and the instrumentation, the amazing thing is that the largely discredited Myers-Briggs “Jungian” model is still so widely used, particularly in business, when personality psychology has reached working consensus on the evidenced-based five-factor model (Openness, Conscientiousness, Extraversion, Agreeableness, and Neuroticism). But as a point Mike, I don’t think that be an accurate research. we have 2 problems, first of all is ur demographic viewers..for example I assume (correct me if I’m wrong) but as the blog’s typical content is abt strategic aesthetics…or as a blog belonging to a proffesor with certain tendecy on subjects of strategy…lets just say not a typical crazy young-car designer is a typical follower , therefore there is probably will be more similar personality types (persons which have a more common interest) following blog = taking the test . secondly & more importantly is the problem with the definition word “designer” , you’ve already assumed that all the testers are “designers”…but are they? we can’t call someone, just becuz he has chosen this Discipline to be considered as a “designer”…someone can make such choise over many factors that not necessarily has anything to do with the right reason. If we wanted to take a more reliable research on that, we must have chosen pro designers (designers that actually make living out of designing) as our demographic testers. first: FYI, I’m ENTP, though barely P.
second: this idea of ‘optimal type for profession’ has a sticky history— it had been used as a shortcut test to reveal who would make the best executives (NTJs, i think). that said, i think it’s really interesting that there are such definitive trends in people’s tendencies. conflict-resolution in my relationship improved massively when i realized dude was an introvert in disguise. i love meyers-briggs! but i worry about any takeaway that might suggest that there’s an optimal designer personality type. perhaps design process as currently employed tends to support (and therefore retain) more of a certain personality type than others? but that is a different question. third: to the comment from ath, i agree with both points. obviously there are methodological issues that keep this from being anything more than anecdotal evidence, including: how do you define “designer”? I’m in PM at frog design (news! new job. hi! ), with a background in design and social science. what am i in this world? I’m curious as to what was meant by “designers” when the poll was done. There can be widely divergent definitions of that word. Was it graphic designers, web designers (those who do coding and those who do graphics or both even) – interactive designers, fashion designers, industrial designers, movie set designer, costume designer – the list could go on and on. Generally I think of graphic design (though web design is getting lumped in with that category more and more these days) when I hear that term – but it can mean so many things and I would think each type of designer might track a bit differently on the MB test if a comprehensive study was done. But maybe not – who knows? Would be interesting to have more details on this. Pam – I agree, it would be really interesting to look for differences across designer types. I originally shared this experiment with my network of friends and on core77, which is mostly industrial designers and interaction designers if I had to guess. Howdy. This is interesting. I am E(just)NTP and can see what being J might bring to the challenge of meeting deadlines within reasonable time — ie rather than working late into the night. Closing off those ideas in favour of a decision is difficult as a P. I have considered for some tim that I would work better as part of a creative team or even just a suitable partner (ie a team approach to the actual work). And, indeed, a J would be an ideal balance for me.